Aaron was very prompt and professional. Always does excellent work. Highly recommend. Repaired gear drive. Appreciate the great level of service that I've received EVERY time. Precision Door is TOP SHELF! We offer same day installation of doors in many cases. We carry Amarr, Clopay & Wayne Dalton doors. We can also get most any door you want/design. We remove the old door and debris when the installation is complete. We carry 24 gauge steel doors; insulated & non-insulated; with windows & without windows. We have multiple warranty plans from the standard 1-year manufacture's warranty to the lifetime warranty. We offer replacement sections - you can purchase just one section or all four sections. All phones calls are answered 24/7/365. We have evening appointments - until 8:00 PM - at no extra charge. We have Saturday appointments at no extra charge. We have emergency service available for a nominal fee. We have multiple warranty programs available. We offer 5% Military discounts. We accept credit cards - Visa, Master Card, Discover, & American Express. We do background checks and drug screens on all our technicians. Our office hours ar 8:00 AM to 4:30 PM Monday through Friday. We carry parts for Liftmaster/Chamberlain; Lanier; PDS 800; Genie Operators. We have chain drive; belt drive; jack-shaft; and battery back-up options available for our operators. The Liftmaster operators are MyQ capable. We do quotes over the phone. We have multiple warranty packages for you to choose. We repair all versions of operators as long as we can still get the parts. Our door manufacturers: Rytec, Cookson, Amarr, Clopay, Wayne-Dalton, Goff, Kawneer, and Dynaco. We repair, install and make fences and gates. We install and repair commercial/industrial openers. We have gear heads, hoist and trolley commercial/industrial openers. We repair and install rolling steel doors. 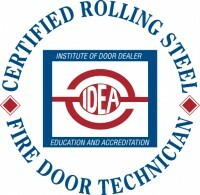 We repair and install fire doors as well as do quarterly/yearly fire drop tests with certified technicians. We have emergency service available for our Commercial/Industrial customers 24/7, a emergency service fee will apply. We work on, repair and install doors up to 100'.